Growing up, I remember teasing my mum about the sheer volume of jackets and coats she'd amassed. Well, the jokes on me because I can barely breathe these days underneath my pile of jackets! No complaints here though, and especially not when it comes to the dilemma of transitional styling. I'm trying to think ahead right now for the sake of March, by finding ways to bridge the gap between Winter and Summer styling. My favourite realisation so far? Tuxedo Jackets are (still) pretty amazing. I have a big fat issue with dressing separately for day and night, and by this I mean I love bringing elements of 'night dressing' into daytime. Needless to say, tuxedo jackets totally play into this. Add a pair of statement earrings and heels, but then tone it down with a casual printed/graphic tee and you've successfully blurred the line! The umbrella seen in this post is another head-turning accessory that playfully refreshes a tuxedo jacket and I love it. 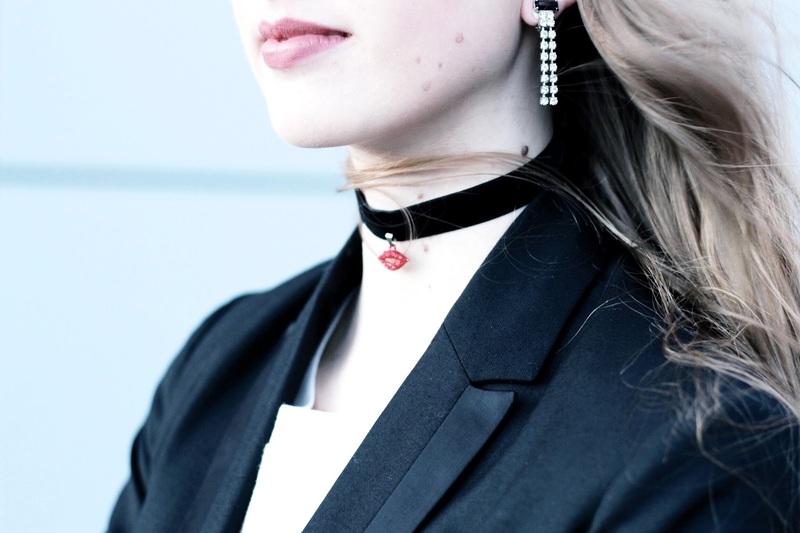 Designed by Lulu Guinness for Fulton, it features a lightweight frame and recognisable Lulu Guinness branding - which I matched with a DIY velvet choker (anyone else addicted to making chokers?!). I'm sure the next couple of months will see me bounce around from sheepskin coats to lightweight jackets and from chunky knits to cropped tees. When the weather can't make up its mind, nor can our wardrobes, right?! Anyway, hope you all have a lovely week ahead - and I look forward to reading your thoughts on tuxedo jackets! You look amazing. In love with this whole look. I am the same way. I will wear the lbd in the day as well as night. Love how you styled the jacket! I love the look, so chic! the jacket is lovely and your hair looks beautiful as always!!! I am a firm believer that you can never have too many jackets. I love the tuxedo style of yours. You styled it so well, looks great on you! Transition style is so hard!!! but I love your tuxedo jacket! Also.... your UMBRELLA!!! That is pretty much my everyday work style. I love how the jacket can be dressed down a little, but still is formal enough to wear there. 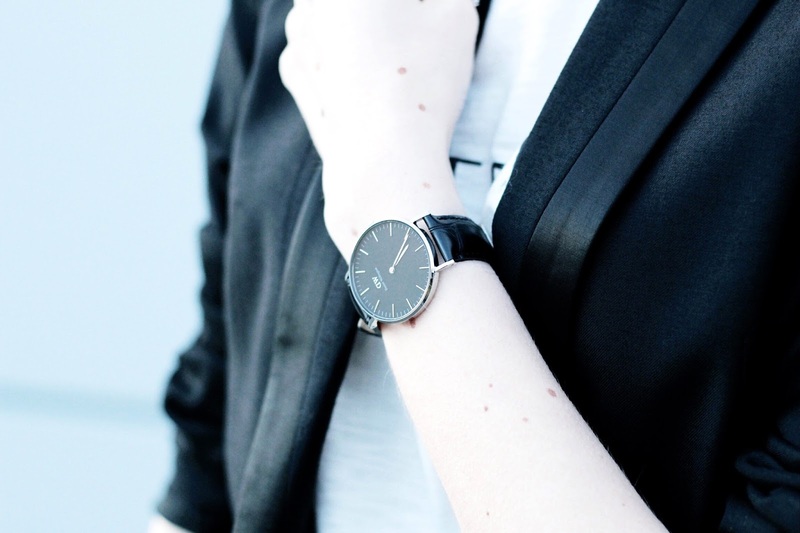 What great pictures, love how you've styled the tuxedo jacket! 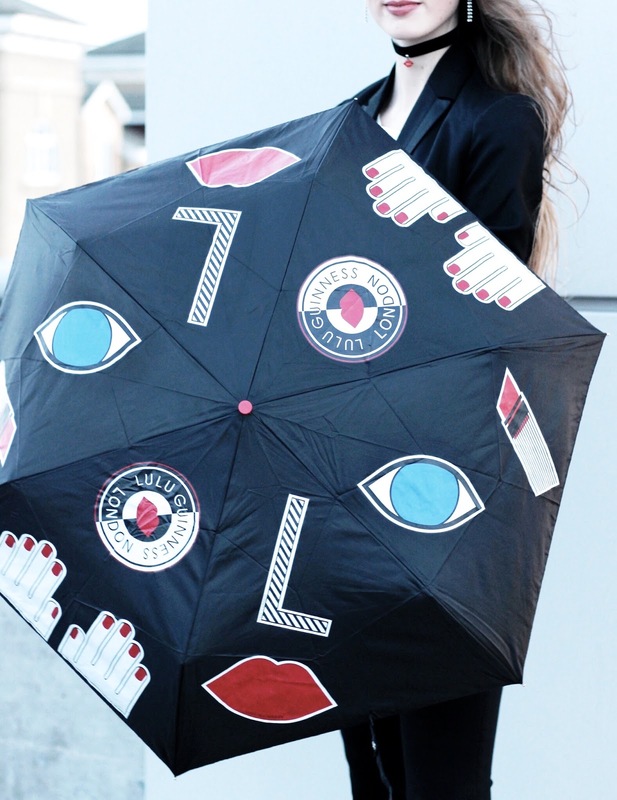 Oh my I absolutely adore your Lulu Guinness umbrella Gabrielle!! I think I'm going to have a shock to the system when I return from Asia and have to wave goodbye to my summer dresses and flip flops :) ! Tuxedo jackets are a great go-between though and I'm loving your outfit!! I love that jacket! It's so fierce and I think the mix of day and night is a great one, so keep on mixing! Also love your trousers, so classic and good! You look absolutely stunning! I love this look! Super cute outfit! I always can't believe how long your hair is girl! I love all the curls in it too. Loving the jacket plus that umbrella combo! I love your outfit so much! The jacket is gorgeous! I have a gorgeous black velvet blazer - a similar shape to this one - that I definitely need to get out! Love the way you styled it! Check out my last post? I also used to tease my mom about this ahaha. You looked incredibly chic in this outfit and the rooftop location is awesome! 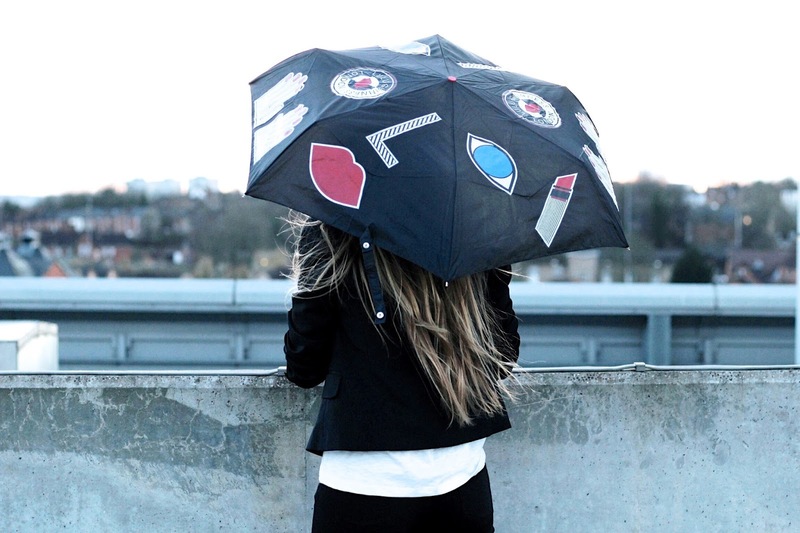 Ummmm so that umbrella is bloody awesome - love the prints on it! Also love it when you rock a slight flare, really suits your figure lady! I'm a big fan of tuxedo jackets. They're really versatile items, aren't they? I love how you styled yours with those gorgeous black flares and a white top. So timeless and chic!!! The rolled up sleeves on this jacket make it more urban and day time appropriate...I've always been a fan of rolled up sleeves. It started as a practical thing- I have a really long arms ( I joke that I have monkey arms) so sometimes finding things that fit can be a challenge....but not I embrace it...and I'm fond of rolled up look. You look beautiful dear. The location and the photos are superb. With that comment about your mother's jackets and coats you made me reminiscent about my childhood. I remember some coats that my mother used to wear. Aren't our mothers our first true fashion role models? I think they are. I remember one coat that my mother used to have, it had this huge bird patch at the back...and now that I think of it, I think that coat really influences my style. To this day I love patches and I love bird prints. Isn't that interesting? Pieces that can blend between "day" and "evening" looks are always such great ones to have! I love how classic your tuxedo jacket is, especially styled with the flare jeans. What a fun umbrella, too! Great styling, the tuxedo jacket looks so elegant, and can be used for casual or dressed up indeed. You are beautiful, dear! Girl, you can never have too many coats and/or jackets! Tuxedo jackets are a great, classic staple, and versatile (who doesn't love that)! I love the way yours pulls this look together. Have a wonderful week Gabrielle! Love the t-shirt under this! I love a well tailored tuxedo jacket and I think it is a classic staple every woman should own because it is so versatile. For some reason the designers bring it around as a trend once every decade or so, and a lot of women now-a-days do not gravitate to this particular style of jacket, which is a huge mistake in my opinion. You look lovely in yours, and I like how you mixed it in some fun and casual pieces. That umbrella captured my attention though. I adore it. I love this smart, professional and a bit masculine look! It would be something I wear to work everyday! You hair is so pretty ! I wish I had as pretty hair as your ! I love the design of your umbrella. Nice outfits ! Looking gorgeous, love the transitional tuxedo jacket, perfect for the chilly sunny days! Hope you are having a great week! bella,adoro le tee abbinate così!! Very beautiful post ! You rocked it like always. great background. Amazing outfit! Love how you've styled you hair. You look great in this smart outfit! And the umbrella is looks so original! I love tuxedo jackets! I agree with you, they are a great piece for the transition between winter and summer! Plus they are so versatile and extra chic! You always look amazing! Very photogenic! Such an awesome umbrella too, how fun! I hope you're having a great week! In love with this look on you! You look so rad and fresh. And as always your pictures are amazing. Love your hair girl.. The whole look is a total win. This is what a great styling of tuxedo jacket should be. And you are right the umbrella adds the hip vibe, I really like your transitional look here Gabrielle. Your hair looks extra gorgeous in this post! I'm also loving your jacket and umbrella! You look amazing! 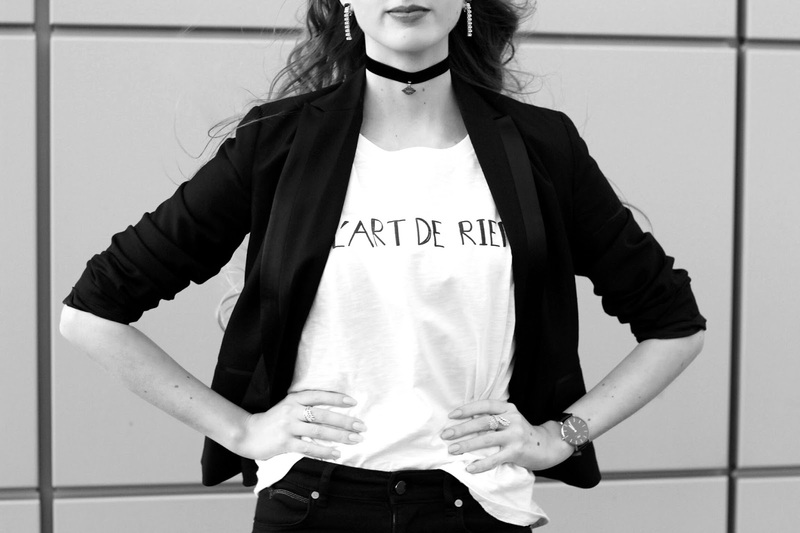 I love menswear-inspired styles <3 And that choker.... I need one! Congratulations on the look. I love it whole. Greetings. Gabrielle, You look simply amazing! I totally adore this look and the flared pants look fantastic with the jacket. You look stunning, love. Couldn't agree more with you, I would rather dress for the night and carry it in the day too. That umbrella is super gorgeous! I love this outfit, flared jeans really suit you! I'm all about jackets and lotsa lotsa layers at this time of year - you just never know what the weather is going to do! Gabrielle you look absolutely stunning! I love the jacket and tee and your hair looks so pretty. The perfect transitional piece. I love how you paired it with those flared pants! And can we take a minute to talk about your hair?! Gorgeous girl! The jacket is lovely Gabrielle! Love your hair in this post, wind was on you side as well! I can never get enough of gazing at your hair! It's so gorgeous! I wish I could be able to keep my hair healthy and gorgeous if I ever decide to leave it as long as yours! Love this look! You look so chic with the black on black and that tuxedo jacket is amazing. I love cool statement pieces like that umbrella too! Gorgeous transition style! The styling of your transitional jacket is just fabulous! Also, love the choker! Tuxedo jackets really are a great piece during a transitional season. And I appreciate your techniques for transitioning your outfit from day to night. Great outfit, and your hair looks so gorgeous when left down. I love that jacket Gabrielle! You styled it beautifully. I love Lulu Guiness. Her accessories are always fun. What a great umbrella! The jacket is pretty, but my favourite thing about your outfit is your tshirt - I love that play on words! Usually I'm not a fan of tshirts with messages written in French (because most of the time, they've got mistakes in them haha) but this is really witty! I wish I had more jackets, but for some reason there's always something wrong when I try them on. Could you believe I don't have a black blazer? Shocking I know haha, I need one!